As a Designer, you are mainly responsible for the success of a project. You have to make sure the final product turns out just the way you had thought it to be. Just like in the movies, it isn’t over till the fat lady sings. Unless you oversee the entire process till the end, you may be in for surprises. A different font may be used, some unwanted colors glares back at you or the sizes and dimensions could be wrong. Most times, by learning from your experience, you’ll find yourself crossing over to the role of the developer, or at least taking a walk to the developers desk or the production bay to check if the final product is turning out the way you intended it to be. Of course annotations is a way to make sure all things are communicated well. But do you always annotate every part of your design? If you responsibly do, haven’t you always wanted this painful and time devouring task to be magically done at the click of a button. With Specctr you can! If you firmly believe that the devil is in the details, and understand that smart work is about smart processes, you are in for a big treat. Specctr may just make your work a lot easier than you can imagine. But hold on just yet. In our Specctr review, we shall look into various aspects of this powerful Illustrator plugin, evaluate it thoroughly and produce the facts that can help you decide if this plugin is the right one for you. 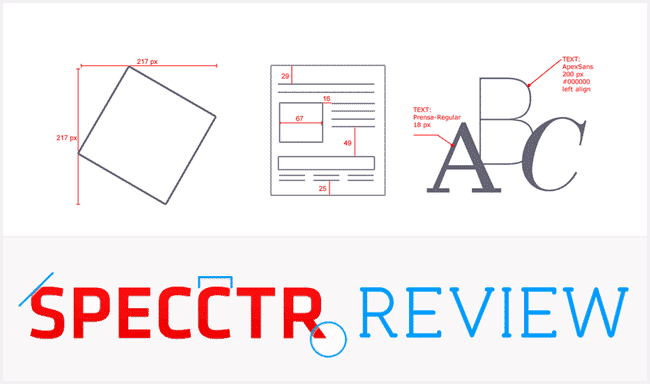 Read on through the Specctr Review as we explore this Illustrator Plugin in depth. What is Specctr and how can it help you? Specctr is an annotation plugin for Illustrator, Photoshop, Fireworks and Indesign. It helps you annotate every element in your design with the click of a button. You can have the fonts, font sizes, object sizes, dimensions and colors and all important design details laid out in a list, in a jiffy. If you’re a graphic designer working in the print industry, this Illustrator Plugin will make sure the printing house gets the finer details of your design right. For package designers this Illustrator plugin is a life saver as it would save them tons of effort and time by outlining all the measurements. Web and UI designers have always prayed for an Illustrator Plugin which could save them hours of documentation and unwanted project discussion with the developers. 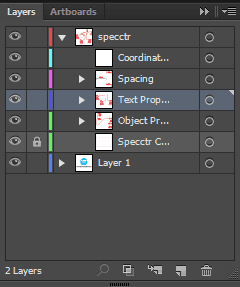 So who created the Specctr Plugin for Illustrator and other Adobe graphic design software? Chen Blume, a graphic and interactive designer co founded this awesome plugin with Dmitriy Fabrikant, a software engineer . They developed this awesome software plugin to bridge the communication gap between designers and developers in an organization. Lets checkout the features and options offered in this Illustrator Plugin for Graphic and Web designers. Since we were interested in doing a comprehensive Specctr review, we got the Specctr Pro Ai : 2.0 to checkout the full range of features and options. Specctr not only adds the specs for you on the click of a button, but also does so in an organized and hassle free way. Expand Canvas – The Expand button expands the canvas horizontally to accommodate the specs. Movable/editable labels – You can easily edit or move the labels around the canvas with the Move tool. Specs organized in layers – All the specs which are auto created are arranged neatly in layers. Multispec, spec multiple objects – You don’t need to spec each object separately. Select several Objects and hit the Button to spec multiple objects, all at once. Line ends – Move the connectors to appropriate spots on your canvas. Export CSS – Once you’re done with the specs, export the style sheet for developer’s reference. Get all your dimensions and spacing accurately and instantly. Specctr lists all the properties of the Objects for you. Specctr lists all the important Character and Paragraph properties as well. You can even choose your specs to be in different units, color values. Tick the relevant Responsive Options and Specctr will provide you with specs in values for Responsive web design. I’m sure the plugin features might’ve bowled you over already. For Graphic design, you have all the specs in place and not a single element is spared that may cause the unnecessary havoc later. Right from measurements; dimensions, spacing and coordinates to Object specs like the Color, outline details, radius along with all the necessary Text info, everything is covered. Fine aspects like the leading and kerning too are included in the specs. 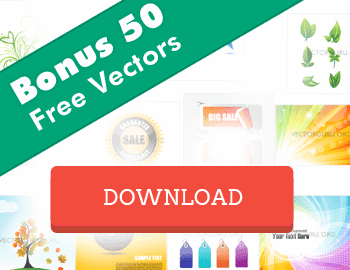 For Package designers this Illustrator Plugin is practically indispensable. With all the boring post design work covered in an instant, you have more time to actually contribute to your main work, which is designing. Web and UI design is an area where the front end developers may occasionally forget a thing or two. And what you end up with is something you wouldn’t call a pixel perfect design. Specctr not only specs away all the details, but with the Export CSS option you have all the styles chalked out for the front end developer’s reference. Additionally Specctr supports responsive design features where the units are measured in percentages and the text in em values. With such amazing options a Web or UI Designer can't ask for more. Specctr is offered as a Single license and also as a Team (Multiseat) License. If you’re gonna purchase a Single Seat License and are looking at using the Specctr plugin for Illustrator alone, you may buy the Specctr for Illustrator at $49. If you would love to use the Specctr for all Adobe Graphic Design applications like Illustrator, Photoshop, Indesign and Fireworks, purchase the Specctr Bundle for $99 only. 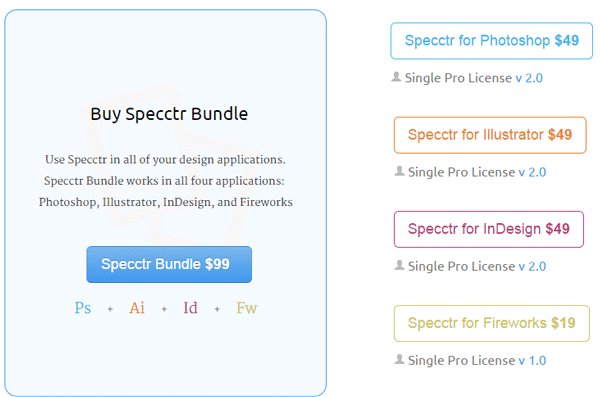 The Specctr Team License is only offered as a Bundle for all design applications. 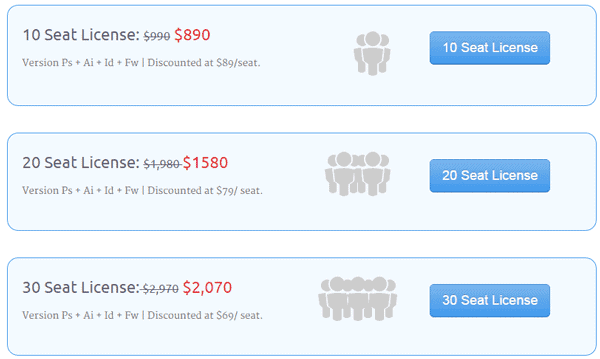 You may buy the 10 Seat Team License for a discounted price of $890, the 20 Seat License for $1580 and the 30 Seat License for $2070. If you have more License requirement than the packages offered, contact the Specctr team for a Site License. Of course the price is an important determinant in your decision to buy this plugin for your design applications. Honestly, considering the amount of time and effort we save with this plugin, I think it is very reasonably priced. If your work and projects suffer because of communication problems and you want to improve the work process and save up that valuable time, Specctr can surely smoothen things out for you. If you’re a designer striving for efficiency and believe in smart work, I suggest you give Specctr a shot. You can try out a free version of this plugin for Illustrator which has fewer options but good enough to give you an idea of what the plugin is capable of. That brings us to the end of Specctr review. Specctr 2.0 from On Pixel on Vimeo. I hope you’ve got a deep insight into Specctr through our review. We shall have more plugins for Illustrator reviewed for you soon. So remember to subscribe and keep visiting.